Capture your passing thoughts in this easy-carry journal, an item no serious writer goes anywhere without. It’s a beauty: a luxurious blue cover and 95 lined-ivory pages. The front displays “Write” and the back the Gotham logo. As a bonus, you get a Gotham pen—shaped with elegant curves and topped with a hidden highlighter. Allow seven business days for delivery in the United States. 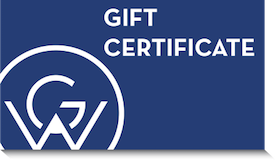 A gift certificate to Gotham Writers Workshop is a great way to encourage the writer in your life.